Child Welfare Services social workers were honored Thursday at their annual appreciation event where the Jay Hoxie Award was handed out. 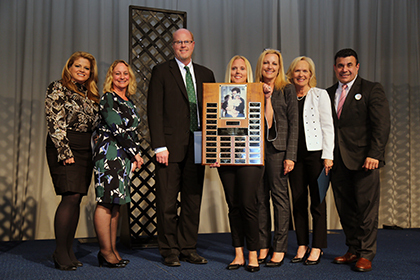 From left: Kim Gallo, East Region general manager; Barbara Jimenez, Central and South Regions general manager; Chuck Matthews, North Regions general manger; 2018 Jay Hoxie Award winner Stacy Hollomon; Cathi Palatella, Child Welfare Services director; Helen Robbins-Meyer, County chief administrative officer; and Nick Macchione, HHSA director. The call can come at any time. It doesn't matter if you've left the office for the day or even if you're enjoying a family member's birthday party on the weekend. When a family or child is in need of an emergency response, a social worker will drop everything and answer the call. But that's not all. Many HHSA Child Welfare Services social workers devote even more of their time to volunteering and donating to improve the lives of families in our communities. Thursday was the annual social worker appreciation event and the announcement of the winner of the Jay Hoxie Award. This year's recipient was Stacy Hollomon, a protective services supervisor with the emergency response unit in North Regions. The award is given to recognize a social worker for commitment to others through volunteering in the community. It’s named after Jay Hoxie, an HHSA social worker who died in a car accident in 1990. He was well known for his generous spirit and community involvement. Hollomon's list of volunteer activities seems endless. She's active with Big Brothers/Big Sisters and a Girl Scouts leader. Holloman also works with local businesses and organizations to create opportunities to empower young girls through activities like food drives and volunteering. She volunteers with Days for Girls International, which provides hygiene products for girls in Africa. Holloman also helps clean beaches and works on environmental causes with I Love a Clean San Diego and volunteers preparing meals for the San Diego Food Bank. "She does some amazing things, heartfelt things in this world," said Chuck Matthews, HHSA North Regions general manager. "Her passion extends into our community and in fact half-way round the world. “She embodies what Jay stood for and spent a large part of his life working on." - Alejandra (Anne) Azemi, Centralized Child Welfare. Azemi volunteers with families, youth and students from other countries. She's helped refugees from Africa to resettle in the San Diego Community and adjust to the culture. She and her husband also host a foreign exchange student every year. - Karen Norkowski, South Region. Norkowski and her children volunteer with their church to cook and deliver meals. She traveled to Mexico last year to build a home for a family, also with her church. - Marisa Rosales, Central Region. Rosales owns a classic 1947 Hudson and as a member of Duke's Car Club, uses her vehicle to promote events that help children, Wounded Warriors and homeless adults. They also adopt families at Thanksgiving and serve meals downtown. - Karen Hockensmith, East Region. For the last five years, Hockensmith has done fundraising for non-profits that work in international communities to improve the lives of refugees by teaching them agricultural skills. She volunteers with Kids Alive, an organization that provides for orphaned and abandoned children, and raised money last year for hurricane victims in Puerto Rico and international medical assistance. Foster Care Eligibility workers were also honored for their volunteer efforts. Alejandro Mojarro-Mercado and his family show their appreciation for first responders every holiday season by baking cookies for their local fire station. He also helps keep the neighborhood around his church in Linda Vista clean. Marlena Jones has served a mentor in her church for the past two years. This year she's participating in a 28-mile, one-day endurance hike along the Pacific Crest Trail in Big Bear hoping to raise $2,500 for the Make-a-Wish Foundation.